Hot Wheels® Sets Third World Record in 18 Months with Successful Landing of Giant Corkscrew Jump | Mattel Inc.
EL SEGUNDO, Calif.--(BUSINESS WIRE)-- Hot Wheels® set its second world record this summer and third in 18 months pulling off a 92-foot corkscrew jump in a life-size Hot Wheels® performance buggy. Taking place at an undisclosed part of the Hot Wheels Test Facility during the filming of an online episode, the corkscrew jump comes directly on the heels of the Guinness World Records® title set by Team Hot Wheels at X Games Los Angeles in June. Team Hot Wheels also set a world record for the longest distance jump in a four-wheeled vehicle at the 2011 Indianapolis 500. View the record-breaking corkscrew stunt at Hot Wheels YouTube page. 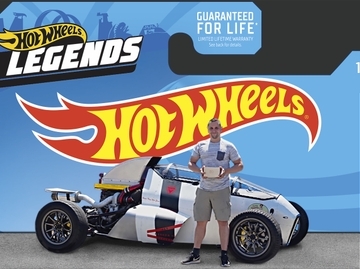 "What started as a dream to make Hot Wheels for real has transpired into a world record trifecta that has well exceeded our expectations in bringing the brand to life," said Simon Waldron, vice president marketing, wheels, Mattel. "Team Hot Wheels has continued to transform fantasy into reality on a grand and global scale — engaging consumers and fans of all ages." Team Hot Wheels is comprised of the most fearless and skilled drivers in the world. Each team driver is exemplified by a unique personality and driving style, and they take on only the most outrageous stunts. Deemed in the stunt world as an extremely difficult car stunt to perform, the Hot Wheels corkscrew jump took the world record for the longest ramp to ramp spiral 360 in a four-wheeled vehicle. Acclaimed Hollywood stuntman Brent Fletcher, driving for Team Hot Wheels' Team Green — known for their need for speed — reached a calculated speed of 54 MPH before hitting the jump, then rotating at a rate of 230 degrees per second in the air before successfully touching down 80 feet later. The 2,600-pound Hot Wheels performance buggy was specially outfitted for the attempt, with the driver's seat repositioned to the center of the car to make it spiral properly. Fletcher is known for his stunt work in numerous major Hollywood blockbusters, including "Fast Five" as well as his work with Hot Wheels® as the stunt coordinator on the Hot Wheels® Double Loop Dare at X Games Los Angeles. Hot Wheels fans can now wear their world record pride like never before! Through a new partnership with popular apparel manufacturer Suburban Riot, the brand will be creating new Team Hot Wheels stunt inspired T-shirts available globally at www.thwstore.com. The men's and women's shirts, which are briefly featured at the end of the corkscrew stunt video, will retail for $20.00. 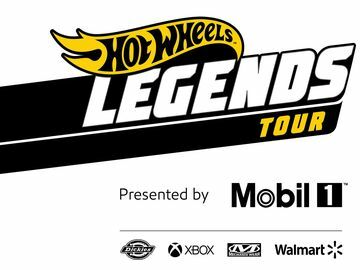 Fans can also interact with Team Hot Wheels through their favorite social media channels including: Facebook and Twitter. The corkscrew stunt and Team Hot Wheels' other world records can be viewed on the YouTube channel. Since 1968, Hot Wheels has been passionate about creating thrilling vehicle experiences through innovative product and content. With a fan base of more than 41 million people, Hot Wheels is the No. 1 vehicle property in the United States producing the coolest cars imaginable. The Hot Wheels brand began as a line of 16 1:64-scale die-cast vehicles; today, it has evolved into a true, global lifestyle brand for boys of all ages with segments that range from aftermarket parts to licensed apparel to branded digital content from Team Hot Wheels, a real-life race crew of professional drivers performing over-the-top stunts. Check out the official Hot Wheels website for the hottest car games and racing videos, and be sure to visit the Hot Wheels Facebook page.